The George F. Barker Papers were in the possession Dr. Horace G. Richards. After Dr. Richard’s death they were presented by his widow to the University Archives, with the exception of the text book “Physics: Advanced Course” which was transferred to Professor T.D. Cope. After Professor Cope’s death, this was also transferred to the Archives to be retained with the Barker papers. Within each folder, the material is arranged chronologically. Undated pieces are in the front of the folder. George Frederick Barker was born in Charlestown, Massachusetts in 1835. After graduating from Yale, he worked as assistant to Harvard Chemistry Professor John Bacon. He then served as a chemistry professor at Wheaton College, Albany Medical College, Western University of Pennsylvania, and Yale Medical School. In 1872 Barker was elected as Professor of Physics at the University of Pennsylvania, where he taught until his retirement in 1900. Penn awarded him an honorary Doctor of Science degree in 1898. Barker was active as an author, editor and public lecturer. His publications included articles in scientific journals as well as chemistry textbooks. He served as an editor of the American Journal of Science and the Journal of the Franklin Institute. He served as president of the American Chemical Society and as a vice-president of the American Philosophical Society. Barker’s network of scientific colleagues included Thomas Edison and Marie Curie and his interests included research relating to the telephone, telegraph, light bulb and the calculations of the transit of Venus. His own special interest was in spectroscopy. Because of his scientific interests and achievements, Barker was involved in a wide range of other activities beyond the classroom. He was involved as an “expert” in court cases, both in criminal cases and in patent litigation, including suits involving Edison Berliner and also the Justice Department and Bell Telephone Company. 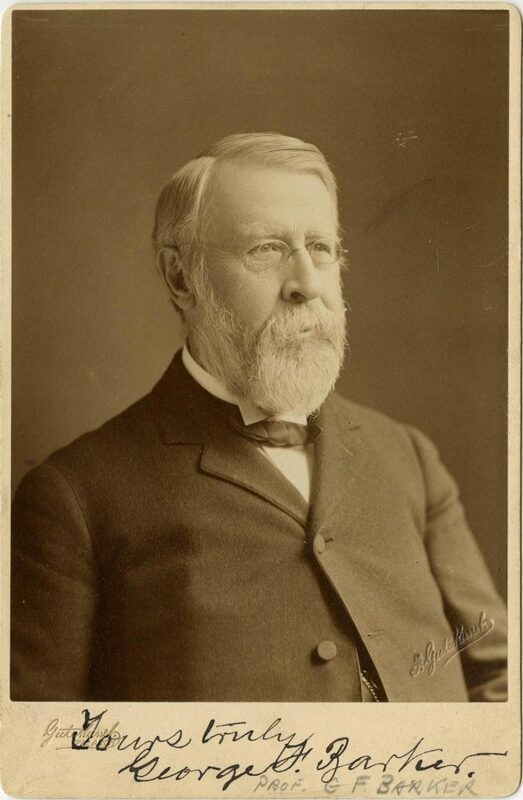 Barker served as United States Commissioner to the both the Paris Electrical Exhibition in 1881 and the Electrical Exhibition at Philadelphia in 1884. This collection includes correspondence and papers related to Barker’s academic and scientific activities, organizations and colleagues. In addition, the collection contains Barker’s own annotated copy of “Barker’s Physics” plus materials related to his lectures and published articles.